In 2010, over half of the global population of 7 billion people resided in urban areas and according to The World Economic Forum’s 2014 Global Risk Report, the global urban population is projected to double by 2050. 72% of the projected 9.3 billion people will be urban dwellers. In light of this, demand for water and sanitation services is estimated to escalate by 40% by 2030 alone, placing additional strain on our fragile water resources. Climate change is also putting a strain on water resources. The natural hydrological cycle has been disturbed by droughts increasing by 20% over the last 30 years and there is also heightened risk of flooding, as many natural drainage systems in urban areas have been replaced by concrete, increasing surface run-off and reducing groundwater supplies. This is problematic, given that only 3% of the world’s water is actually available for human consumption. 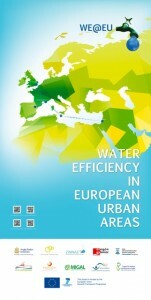 As part of the European Commission’s ‘Europe 2020’ vision, Opportunity Peterborough and the Global Sustainability Institute at Anglia Ruskin University have partnered with 4 other European regions to deliver the ‘Water Efficiency in European Urban Areas’ (WE@EU) FP7 funded project. This platform has been created to co-ordinate Research, Development and Innovation (RD&I) in water efficiency and urban water management. It will provide an innovation-friendly environment, in which partners can collaborate trans-nationally, working together to transform knowledge and expertise into innovative products, services, and skills in the water efficiency sector. This knowledge-driven partnership aspires to strengthen regional capacities, unlock business investment and create new opportunities through the sharing of best practise approaches. Developed and implemented joint action plans at the European level to increase regional economic competitiveness. As part of the project, Opportunity Peterborough and the Global Sustainability Institute at Anglia Ruskin University will identify synergies, through the creation of networks, working groups, and research hubs, whilst also hosting a number of business focused events and meetings. This will enhance business to business relationships, not only within the East of England, but also at the national and international levels. We welcome all stakeholders with an active interest in improving the efficiency of urban water management to get in touch if you would like to be part of this exciting and fully-funded initiative. We welcome interest from businesses, academia, local authorities, not for profit organisations and water companies. Or contact the Project Manager, Katie Hiscock for further information. This project has received funding from the European Union’s Seventh Framework Programme for research, technological development and demonstration under grant agreement no 320007.